Pathogen: Aphelenchoides spp., including strawberry crimp nematode A. fragariae and chrysanthemum foliar nematode A. ritzemabosi. Host: This disease is detected on over 200 hosts, including foliage and flowering plants, herbaceous and woody perennials. Symptoms: (see photo 1 below) Aphelenchoides spp. can feed within or upon the leaf tissue. The initial symptom is a chlorotic (or yellow) linear lesion, which later becomes brown or necrotic. This leads to leaf tattering and defoliation. The most characteristic symptom of foliar nematode on hosta and other plants is the vein-limited symptom, because the vein is a physical barrier of nematode movement. Disease cycle: Plant parasitic nematodes have a simple life cycle, from egg to adult (see photo 2 above) via juvenile stages 1, 2, 3, and 4. Most of the foliar nematodes overwinter in leaf tissue. They can survive a long time in debris in a desiccated state. Splashing water, like rainfall, or overhead irrigation aids in transmission of foliar nematode from infested tissue to new tissue. 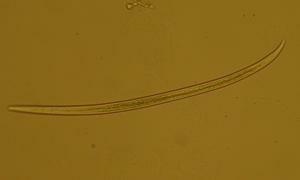 Management: The most important and easiest way to manage foliar nematodes is avoidance. Choose uninfected plants in the nursery. Mid to late summer is the time when symptoms are most obvious, so monitor for them in the landscape at this time. 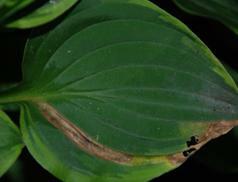 If symptoms are found, removing the infected tissue can reduce the population of foliar nematodes. Reducing wetness on the leaves is also an effective method to prevent spreading of foliar nematodes, so avoid overhead irrigation, if possible. Another method is hot water treatment. This consists of a hot water drench at 70 °C to 90 °C (158 to 194 F). Although this method dramatically reduces the foliar nematode population in the soil, it is not as effective in the leaves. Hot water has no adverse affect on the growth of hosta.